I think we’ll have to start clocking how long between a new Apple device comes out and the point at which the folks at iFixit take it apart. Call it “mean time between disassembly,” if you like. Apple’s updated Mac mini, released on Tuesday, is the latest to go under the screwdriver. The version taken apart by the iFixit crew is the stock model with optical drive, not the two hard drive server edition. Most amazing mini to my eyes is just how few pieces you’ll actually find inside the new mini. That’s little surprise, I suppose, given the computer’s ultra-compact form factor, which in many respects looks more like the Apple TV than its own predecessor. While the black plastic cover on the underside of the unit makes it easy to upgrade the RAM (no more putty knife! ), anything beyond that will require some screwdriver action. Since the aluminum of the mini is a unibody construction, like the MacBook Pro line, you actually remove most of the mini’s innards by pulling them out via the black plastic back plate. Overall, the new mini is neat and clean, and reminds me more than a little of what I think Steve Jobs was shooting for with the PowerMac G4 Cube of yesteryear. 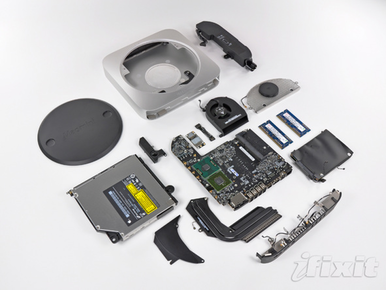 Of course, for more on the Mac mini, check out the hands experience of our own Dan Frakes.